His Eminence Metropolitan Methodios has completed a 12-day official visit to Greece and Bulgaria. The Metropolitan began the trip in Athens celebrating the Sacrament of Holy Baptism at the invitation of the family. Following the Baptism, His Eminence traveled to Thessaloniki where he met His Eminence Metropolitan Barnabas of Neapolis and Stavropolis, the Chancellor of the Metropolis of Boston, Fr. Theodore Barbas, Mark Adam, a member of the Metropolis Council, and Konstantinos Kollias, a seminarian from the Metropolis, for a pilgrimage to the monastic community of Mount Athos. 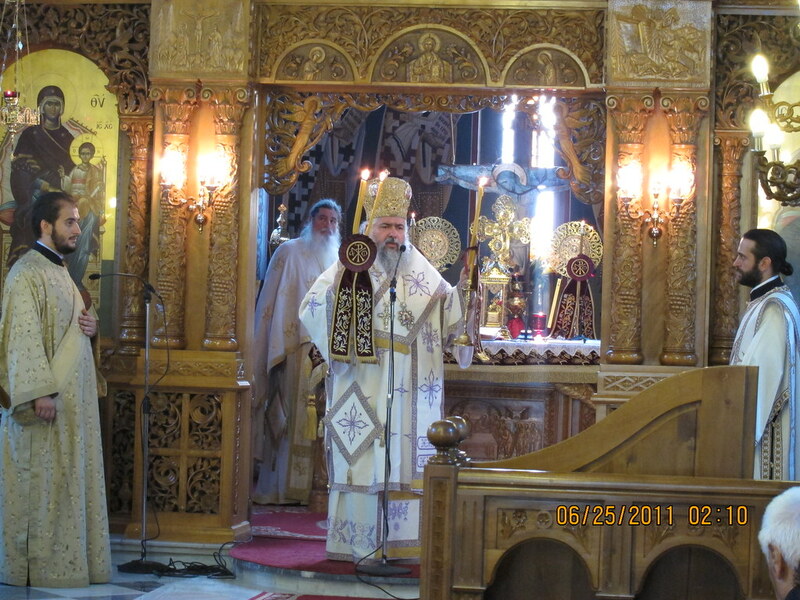 There Metropolitan Methodios celebrated the festal Great Vespers, Orthros and Divine Liturgy at the Holy Monastery of Simonos Petras on the feast of St. Methodios, Patriarch of Constantinople and Confessor, according to the old calendar, assisted by Archimandrite Elisaios, Abbott of Simonos Petras, Fr. Theodore and a number of the Holy Fathers of the monastery, including Fr. Iakovos (formally known as Bill Bakos from Boston). Following these feastal celebrations and a tour of the Simonopetra Monastery, the delegation then visited the Holy Monastery of Xenophontos, where Metropolitan Methodios offered a Trisagion Prayer at the grave of his predecessor, Archbiship Ezekiel of blessed memory. The Archbishop is a former Bishop of Boston and Scholarhi of our Holy Cross School of Theology.